This article will cover general specifications, top features, and the pros and cons of the Razor 500 DLX Dirt Quad Bike. We look at design features such as the brakes, frame, and the motor. Next up are unique design elements that stand-out. Lastly, we’ve added a video that shows a kid putting the quad through its paces around a yard. Today’s battery-powered vehicles offer children of various ages a fun riding experience. The Razor 500 Dlx Dirt Quad Bike is designed to fill the gap between smaller vehicles built for younger kids and full-sized adult bikes. The 36-volt batteries used to power the Razor 500Dlx Quad Bike will generate top speeds of 12-mph, depending upon the weight of the driver and the surface conditions they ride on. The Razor 500 battery is upgraded to provide up to 60-minutes of run time between full charges, a substantial increase from earlier generations. High-torque engine design coupled with solid gearing can transport larger teens or adults that weigh up to 220-pounds, a maximum that doubles other electric quad bike ratings. A variable speed hand grip throttle gives the rider speed control that is not offered with an off/on throttle control. The lever control for the rear disc brakes is mounted to the left side of the handlebars to provide a realistic simulation of adult quads. It has a powder-coated steel frame that provides durability in various terrain and should also offer decent resistance to the elements it operates in. Each fairing is made from shatter-proof plastics that offer some give while withstanding bumps, hard impacts, and scrapes. It uses coil shocks for the rear suspension to help absorb vibrations from bumps and dips that are found in uneven terrains. This product comes with a battery charger that will provide a full battery load after 12-hours of outlet charging. A brush-bar is positioned between the two front wheels and is designed to offer some impact protection for the bike and driver. Its rear suspension is fully active and should provide extra traction on uneven terrain and through the mud. This video shows an older child riding on the quad on semi-smooth terrain with grass and leaves. In the audio, the varying speed from the throttle can be heard as the bike turns around trees in the yard. 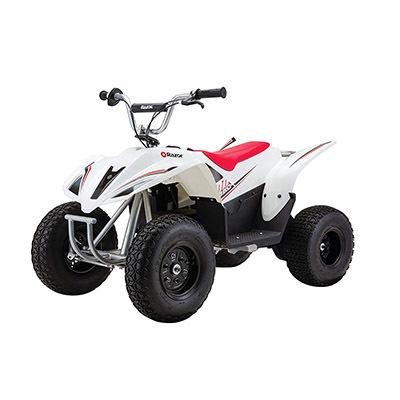 The Razor 500 Dlx Dirt Quad Bike is designed for older children and adults looking for a casual quad ride. Please share your child’s or your own personal experiences riding this quad. We’d also love to have you share any advice or thoughts with readers as well! Join your kid on the track with one of these go karts for adults.